My first two shows at the Goodfoot, were 2004 and 2005. Natalie Oswald and I worked together to create series of collaborations that we did in a improvised style, working on them at the same time, passing pieces back and forth. Some great work came out of it and I learned a lot each time, lessons that I apply to my solo work as well. Some concepts are Non-attachment to the outcome or the object, being open to new techniques, learning from others and being willing to share ideas and techniques because it only progresses a style/movement/scene. This series has four collaborations so far. Natalie painted/printed the background for the “Glow Koi” piece. 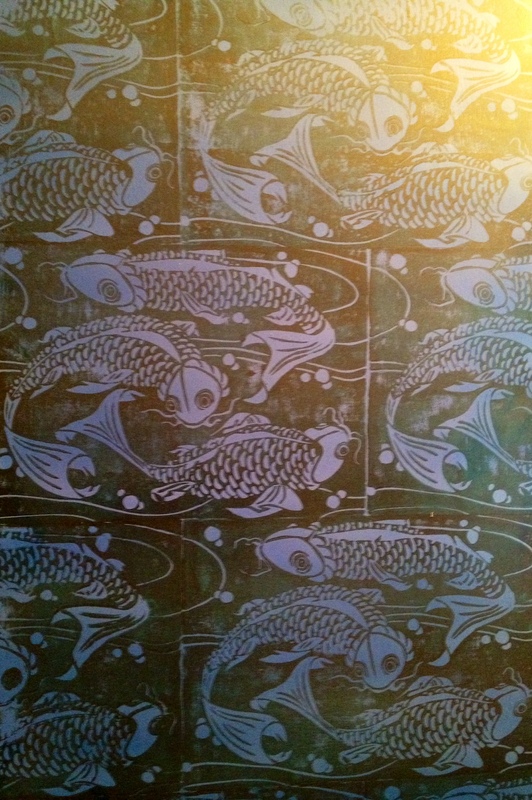 It has some neat gold iridescent effect on top of the fish print. I finished one piece and here is a detail of a second piece that she started, same as the one I finished. I like working with artists that I know will bring their best effort and do something rad even if it’s not what I expect. For this series, I had requests as to what I wanted them to add, but was open to however they wanted to do it. 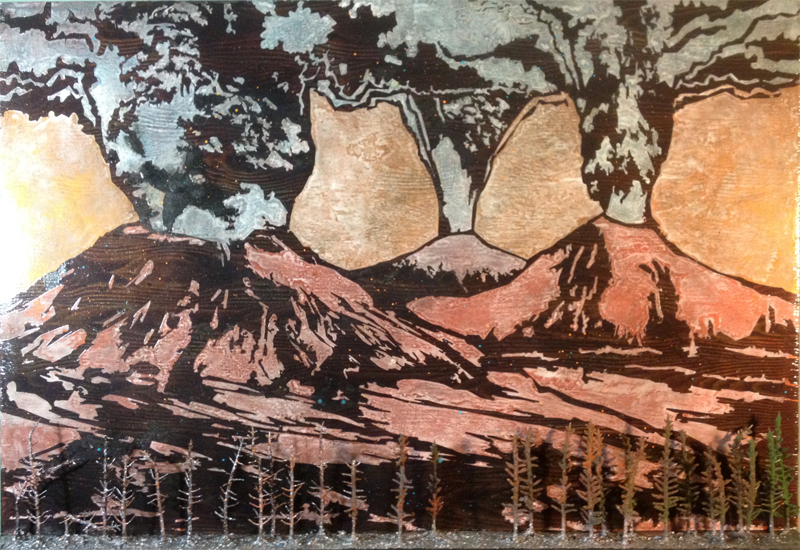 Heather DeWitt does some super cool miniature scenes, so I asked her for a forest to put on a shelf in the foreground of my first volcano painting. 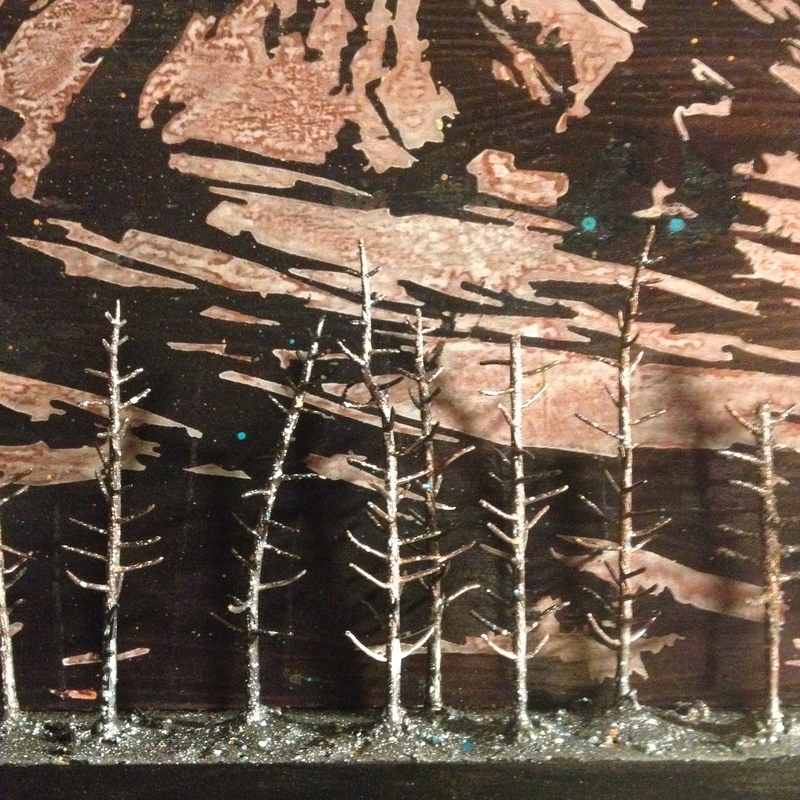 She made a partially burned treeline and we co-painted the ground and trees. Detail, Fire Crane, I love that she took the sci-fi element to a new level with the mutant version of the crane! Lots of linework and stippling! 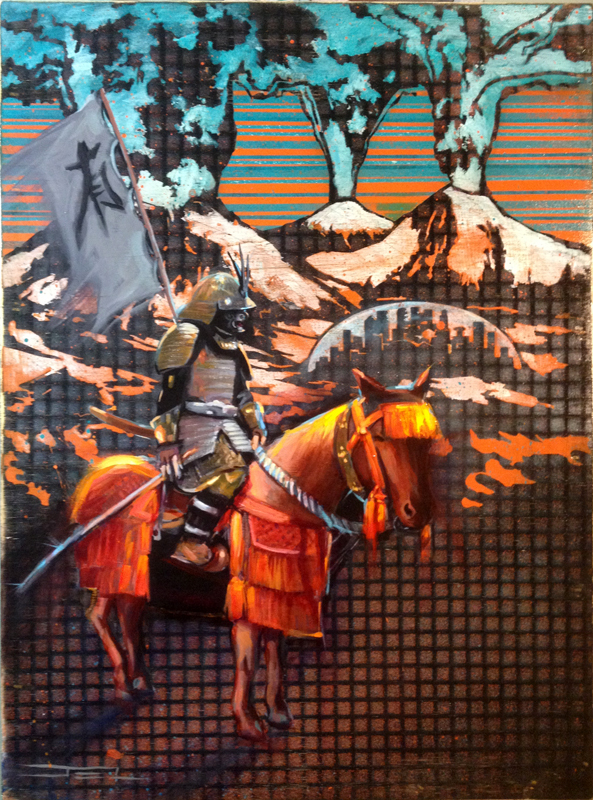 I had a few ideas for Jonny Luczycki, but with the show approaching we settled on a samurai. 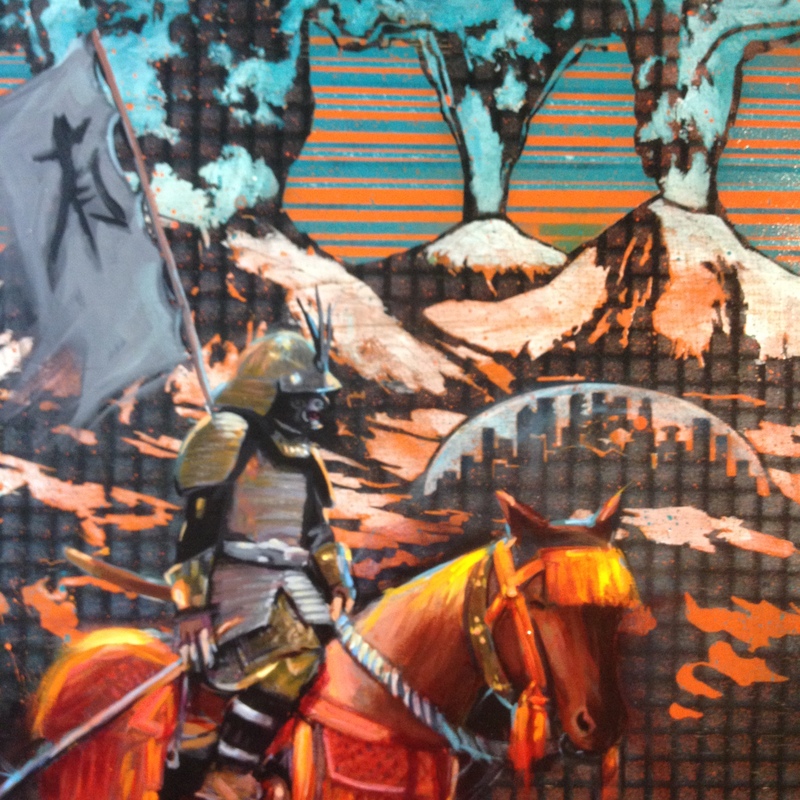 The samurai is an element that worked its way in because of the Japanese print influence. Now it’s part of the narrative in this future world. Why samurai? I like the idea that it’s a return to old ways. It makes sense to me that in the potential destruction of cities, collapse of the technology grid, etc. that the bad asses would return to a simple and noble code. Detail, The Way, I like the painterly style on top of the graphic background. It’s good balance. It’s satisfying for me to see the same palette in two approaches. 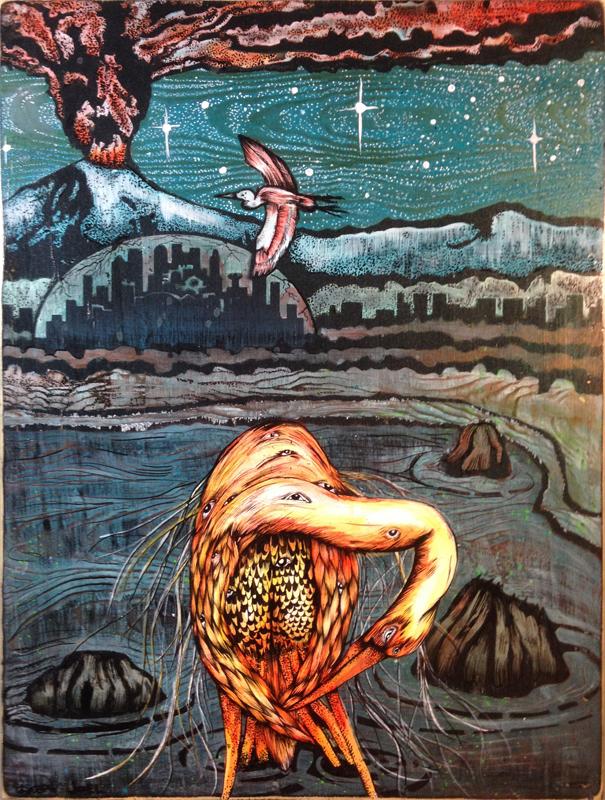 This entry was posted on February 11, 2014 by artdamagedportland. 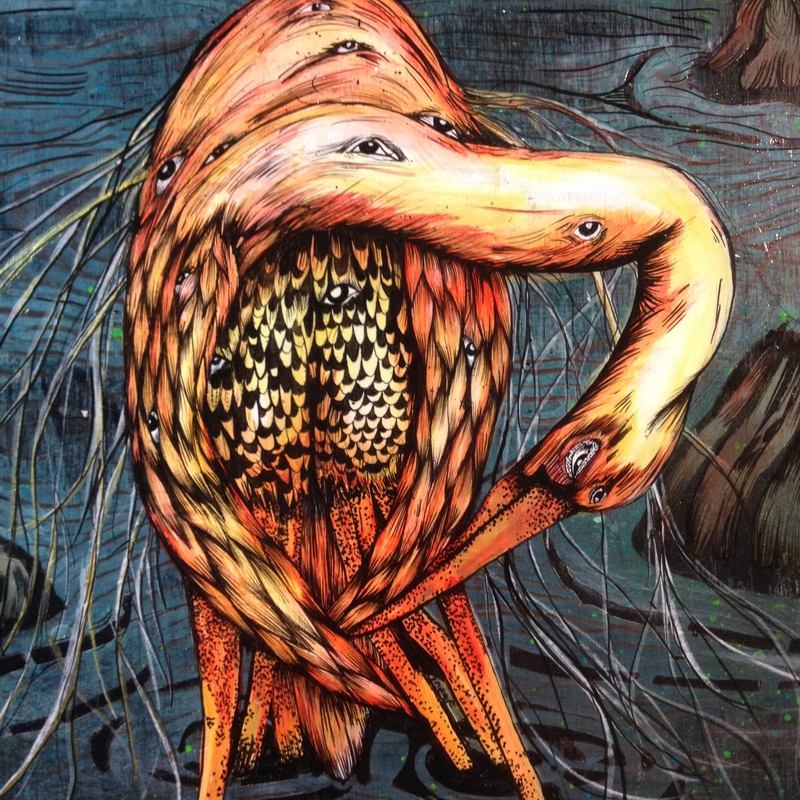 It was filed under Uncategorized and was tagged with art, Cascadia, collaboration, crane, heather dewitt, heidi elise wirz, heron, jonathan luczycki, koi, natalie oswald, painting, samurai, volcanos.